Snapshot: Vacationing in Quebec City! We’re back and it’s officially fall! We had a wonderful time on vacation! This was Victory’s second vacation and her second time visiting Quebec and it was very nice! We began our vacation in Manchester, Vermont for a few days, and then on to our destination, Quebec City! (We stayed further north in Quebec this year from last year.) Doug, fortunately, drove the entire way both ways and Victory sat on my lap! To make the 14 hour drive home go by more quickly, we listened to the entire Serial Podcast! We were really fortunate that we had nice weather and nice temperatures during our entire vacation! Doug and I relaxed and we did not do any work during our vacation, which was very liberating! Thus, today’s post is a sneak peek, as I have not finished editing the images from our trip. If you follow along on Instagram, I shared a few images from our vacation during our vacation! We had a great time in Manchester, Vermont, which is extremely dog friendly, and Victory was able to go into all the stores with us. We took Victory to Mount Equinox, and the views were just beautiful and it was so peaceful. We also previously took Biscuit to Mount Equinox, and we thought a lot about our Biscuit. We also took Victory to the Orvis Flagship Store where Victory had fun trying out (picking out — Victory now has 5 Orvis beds) the Orvis dog beds and trying on her new Orvis coat! (Flannel is supposed to be in, so Victory is ready!) We also went to the Vermont Country Store, where I got some goodies and Victory walked around with Doug! We also visited Robert Frost’s home. On the way to Quebec City, we stopped for lunch in Montreal at the Orange Julep! The Orange Julep has the world’s best orange juice ever, and I took a half gallon to the house we rented! Plus, you have to love that the orange juice is served from an orange! We made it to our lake house that we rented for several weeks just outside of Quebec City located on the Saint Lawrence River. The views were wonderful and beautiful and the sunsets were grand! Victory had a great time and she loved looking at the water. We left her ‘hut’ at home this year and she managed well. We also made ample time to relax, read, and take long walks together. We also discovered the best ice cream ever! We walked down to the water when the tide was low and we had a lot of fun with Victory! Also, Doug and I are now hooked on The Bridge (the original Swedish/Danish version) — we watched the first season on Netflix and we look forward to season two! We went to the vineyards located on an island not too far from where we stayed. It was very pretty with a real French-country feel. The iced cider and fire cider are very popular, as there were many apple orchards located on the island! We went to Quebec City multiple times. 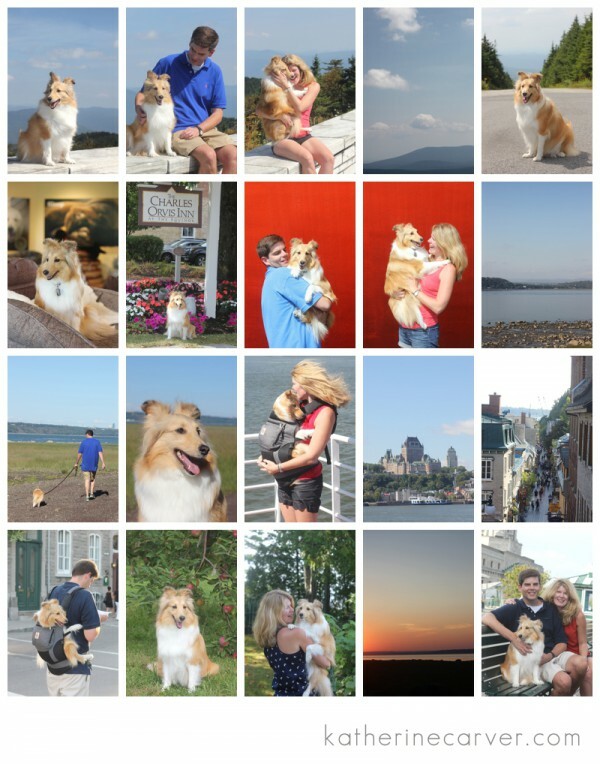 On our first visit to Quebec City, we even met a native sheltie named Choco! We ate outside with Victory in Quebec City and the food was absolutely delicious! We also walked all over the city and did some shopping. Quebec is probably the closest Victory will come to France! This year, we left the Hound About at home as the streets and alleys are cobblestone, narrow, and crowded in Quebec City, making it difficult to push her in the Hound About. As such, we purchased the Ergo Performance Carrier prior to leaving for our trip. Just before leaving, I researched possible carriers for our vacation and the Ergo Performance Carrier seemed to be the best option for support and for its material — it has a breathable mesh material as our fur girl is covered in fur after all! Doug was skeptical at first, but the Ergo Performance Carrier even won him over! Victory loved it and many people took her photograph in her Ergo Performance Carrier and many people came up to us to meet our Victory! Victory got to see the world from a whole new perspective in her Ergo Performance Carrier versus about a foot off the ground! I am sure that the Ergo Performance Carrier will come in handy in the future as well! We are totally smitten with our fur girl and we are more than ok with having the most beautiful, loved, and coddled sheltie girl around! Oh, how can we forget Tim Hortons? Doug loves Tim Horton’s; we do not have one near us; and they just are not the same in the U.S. So, as a result, we ate way too many donuts over the course of a few weeks! The frosted cinnamon rolls are fantastic — I’m sure I had about a half a dozen of them! Most of all, we are grateful for our time away together. We enjoyed spending time together; getting away; having a break; having a change of scenery; and having days where we had no plans and were able to take each day as it came! Everyone was nice in Quebec City and the pace of everything was much slower than we are accustomed to, which is refreshing! Even after 14 hours in the car on the ride home, Victory still spotted her exit to her house. She was exhausted, she did not sleep a wink in the car on my lap, but she still managed to recognize her exit to her house and to the garage — one of her all time favorite activities — returning home via the garage! She was so excited to be home in familiar surroundings! Enjoy the snapshot of photos from our vacation below! Once I finish editing the images from our vacation, I will put a proper blog post together to share in the next week or two, I hope. Stay tuned.